Found 4 file extension associations related to Intel Visual Fortran Compiler and 2 file formats developed specifically for use with Intel Visual Fortran Compiler. The Intel Visual Fortran Compiler for Windows unleashes the vast potential of next generation multi-core Intel® processors. The Professional Edition not only comes with the compiler’s breadth of advanced optimization, multi-threading, and processor support, including automatic processor dispatch, vectorization, and data prefetching, it provides an optimized math processing library as well. The Intel Professional Edition creates a strong foundation for building robust, high performance parallel code at significant price savings. The Professional Edition combines a high performance Fortran compiler with the Intel® Math Kernel Library (MKL). MKL allows you to boost application performance with a set of highly optimized, thread-safe, mathematical functions for engineering, scientific and financial applications requiring high performance on Intel® platforms. The Professional Edition with IMSL* Fortran Numerical Library combines the compiler with both Intel MKL and IMSL. The IMSL Fortran Library for Windows provides over 1,000 mathematical and statistical algorithms covering numerical optimization, nonlinear equations, LAPACK, BLAS and more. Intel® Compiler Suite Professional Edition for Windows includes all the features of the Intel Visual Fortran Compiler Professional Edition, but also includes the Intel C++ Compiler for Windows, Intel Threading Building Blocks, and Intel Integrated Performance Primitives for a more complete solution at significant price savings. High Performance Parallel Optimizer (HPO) - offers an improved ability to analyze, optimize, and parallelize more loop nests. This revolutionary capability combines vectorization, parallelization, and loop transformations into a single pass which is faster, more effective, and more reliable than prior discrete phases. Automatic Vectorizer - analyzes loops and determines when it is safe and effective to execute several iterations of the loop in parallel. Profile-Guided Optimization (PGO) - improves application performance by reducing instruction-cache thrashing, reorganizing code layout, shrinking code size, and reducing branch mispredictions. Interprocedural Optimization (IPO) - dramatically improves performance of small- or medium-sized functions that are used frequently, especially programs that contain calls within loops. 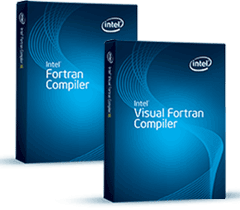 If you need more information please contact the developers of Intel Visual Fortran Compiler (Intel Corporation), or check out their product website.